This issue of Technology News and Trends highlights various techniques used to design, construct, and operate permeable reactive barriers containing organic reactive media. Implementation of these "biobarriers" (PRBs) involves amending the aquifer with relatively inexpensive and readily available carbon-donor materials capable of enhancing biological degradation of contaminants. Several federal agencies are evaluating this technology particularly for treatment of ground water contaminated with perchlorate or volatile organic compounds. The U.S. Department of Defense (DOD) has nearly completed an Environmental Security Technology Certification Program (ESTCP) evaluation of a PRB containing emulsified oil substrate (EOS®). The pilot study was initiated in 2003 at the Alliant Techsystems, Inc., facility in Elkton, MD, to evaluate effectiveness of EOS technology for enhancing biodegradation of perchlorate and chlorinated solvents. A single dose of low solubility, low viscosity, and slowly biodegradable edible-oil emulsion was injected directly into the contaminated aquifer. Post-treatment monitoring indicates that introduction of this reactive medium provided sufficient organic carbon to support biological degradation of target contaminants and consistently maintain contaminant concentrations below target levels for nearly three years. Historical activities at the site include manufacturing of solid propellant rocket motors. In the 1980s, routine ground-water monitoring revealed ground-water contamination resulting from a permitted hazardous waste surface impoundment. Site conditions amenable to an EOS PRB included a shallow aquifer located 5-15 feet below ground surface (bgs) consisting of silty sand and gravel with moderate permeability (~29 ft/day), and a ground-water flow velocity of approximately 100 ft/year. Demonstration ease was enhanced by well-defined distribution of contaminants in a commingled plume emanating from a closed surface-water impoundment. Average concentrations of target contaminants in the treatment area were 9,000 µg/L perchlorate, 11,000 µg/L 1,1,1-trichloroethane (TCA), 50 µg/L perchloroethene (PCE), and 90 µg/L trichloroethene (TCE). The demonstration was designed to evaluate distribution of the emulsified oil sufficiently to form a PRB perpendicular to ground-water flow, injection impacts on aquifer permeability and ground-water flow paths, and changes in contaminant concentrations and biodegradation indicators during ground-water flow through the biobarrier. The technology employs emulsified-oil concentrate consisting of food-grade soybean oil, surfactants, amino acids, and vitamins blended to form a stable emulsion with small, uniformly sized oil droplets. Once injected, the oil droplets adhere to sediment surfaces and form a residual oil phase that provides a carbon source and electron donor for long-term in-situ anaerobic biodegradation of contaminants. In October 2003, the biobarrier was constructed approximately 150 feet downgradient from a former source area. A Geoprobe® was used to install ten injection wells 5 feet on center to a depth of 15 feet bgs. Each well was constructed with 10 feet of 0.02-inch slotted screen and casing to the surface, and finished with a sand pack and bentonite seal. The injection setup included minimal equipment: a temporary solution mixing/holding tank, a gasoline-powered transfer pump, injection hoses, flow meters, pressure gauges, and valves. Over two days, a two-person crew injected a total of 55 gallons of diluted emulsion (1:4 EOS and water) into each of the 10 wells, followed by 165 gallons of chase water to distribute and immobilize the emulsion. Soil sampling showed that the oil was distributed between the injection wells and up to 10 feet downgradient, forming a uniform PRB approximately 50 feet wide and 10 feet thick along the direction of ground-water flow. Ground-water conditions upgradient of the barrier generally were oxidative with elevated dissolved oxygen (DO >2 mg/L), positive oxidation/reduction potential (ORP >100 mV), and measurable nitrate (9.5 mg/L) and sulfate (35 mg/L). Emulsion injection resulted in anaerobic conditions within and immediately downgradient of the barrier, with a rapid decline in ORP, DO, nitrate, and sulfate. Dissolved manganese and iron increased shortly after emulsion injection followed by slower production of methane. Within five days of the injection, perchlorate concentrations in injection wells and monitoring wells 12 feet downgradient decreased more than 99%. One month after the injection, 1,1,1-TCA concentrations in the injection and downgradient wells began to decrease with concurrent production of 1,1-dichloroethane (1,1-DCA) and chloroethane. Though implemented on only a pilot scale, this ground-water treatment approach continues to promote contaminant degradation, and additional injections have not been required. Two and a half years after the only emulsion injection, monitoring wells 20 feet downgradient of the barrier show perchlorate concentrations remaining below the analytical detection limit (<4 µg/L) and 1,1,1-TCA concentration reductions exceeding 95% (Figure 1). Hydraulic conductivity measurements indicate emulsion injection has resulted in some decline in hydraulic conductivity due to biomass growth and/or gas production. Tracer tests and detailed mapping of the perchlorate distribution indicate, however, that the change in hydraulic conductivity has not adversely impacted barrier performance or caused significant flow around the barrier. Monitoring will continue until late 2007 to obtain additional information on barrier longevity. Figure 1. Perchlorate concentrations decreased to below the detection limit, and 1,1,1-TCA concentrations decreased more than 95% in ground water 20 feet downgradient of the Alliant Techsystems biobarrier. Installation of the pilot-scale PRB, including two drums of EOS concentrate, cost approximately $23,000 ($46/ft² of barrier). Significant economies of scale are anticipated for installation of larger barrier systems involving wider well spacing. For example, the total cost of a 200-foot PRB at the same site with 10 injection wells spaced 20 feet on center is estimated at $38,000 ($19/ft²). A final cost and performance report detailing this evaluation will be issued in late 2007. Additional information on this project, detailed procedures for designing emulsified-oil biobarriers, and other applications of this technology for source-area treatment can be found at www.estcp.org. Current ESTCP demonstrations are examining design, construction, and performance elements of a semi-passive barrier at the Longhorn Army Ammunition Plant (AAP) in Karnack, TX, and those of an active barrier at the Navy Industrial Reserve Ordnance Plant (NIROP) in West Valley City, UT. DOD's upcoming guidance manual for characterizing and remediating perchlorate-contaminated ground water will reflect site applicability, benefits, and disadvantages identified through the demonstrations. The evaluation focuses on developing optimal strategies for delivering and distributing soluble ground-water amendments serving as organic substrates (the electron donor), thereby creating an in-situ biobarrier. 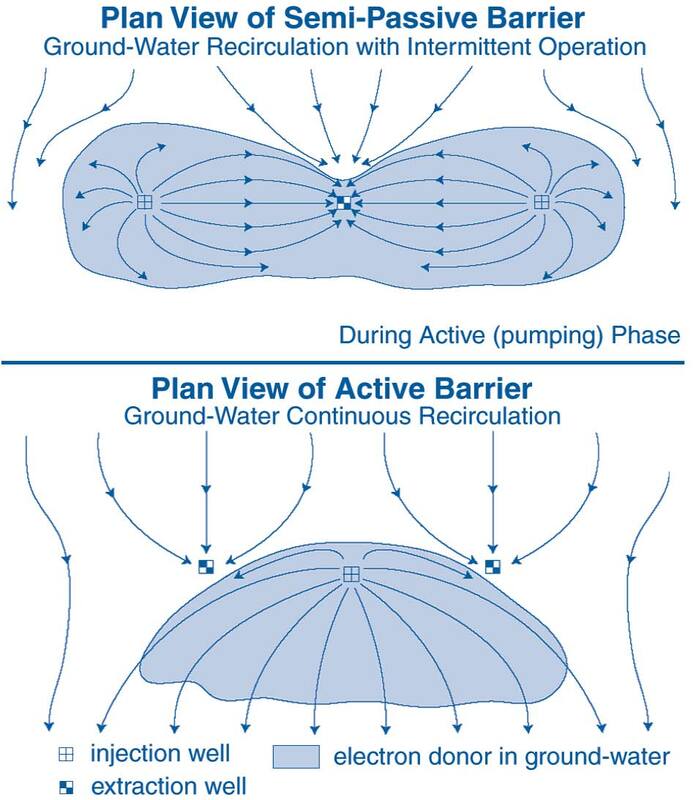 The active approach relies on continuous recirculation of ground water into which amendments are injected, while the semi-passive approach uses intermittent recirculation of amendments (Figure 2). Both approaches employ an electron donor in soluble form that allows easy distribution in the subsurface target zone. This strategy relies upon addition of electron donor in quantities high enough to achieve target perchlorate reductions, but low enough to avoid negative impacts on secondary water-quality characteristics. In contrast, a fully passive system involves injection of large quantities of electron donor during a single injection event, which maintains reducing conditions for several years but can more adversely affect secondary water-quality characteristics. Figure 2. Semi-passive and active biobarriers rely on the same bioremediation process but involve contrasting engineering factors and electron distributions in the subsurface. The Longhorn AAP semi-passive biobarrier was constructed down-gradient of a former landfill, where earlier investigations identified a 250-foot-wide perchlorate plume with concentrations exceeding 3,000 µg/L. A shallow aquifer extends to a depth of 35 feet bgs within interbedded sand, silt, and clay, and ground-water velocity in the treatment zone is approximately 37 ft/yr. Five recirculation wells with 10-foot screens were installed in 35-foot spacing along a line perpendicular to ground-water flow. The wells were designed for use as either injection or extraction wells, depending upon selected ground-water recirculation patterns. The top of each well screen generally coincides with the area's water table, at 14-17 feet bgs. Following pump tests and ground-water modeling, two intermediate injection wells with 15-foot screens were installed between each of the adjacent recirculation wells to enhance substrate distribution. Incorporation of intermediate wells resulted in an estimated 33% reduction in time needed for ground-water recirculation and associated distribution of electron donor across the full barrier. Ground-water travel time between injection and extraction points ultimately ranged from one to several months, depending on flow regimes across the treatment area. Prior to amending the aquifer, ground-water extraction pumps in two of the recirculation wells began operating at extraction rates of 1.7 and 1.0 gpm. After five weeks of recirculation and a tracer test, soluble (60%) sodium lactate was added as an electron donor through three injection wells and eight intermediate wells on a batch basis three times each week. Over a three-week period beginning in late March 2004, a total of 273 gallons of sodium lactate were injected into the aquifer. The recirculation system was turned off, and the system was allowed to operate in a passive mode for eight months, after which a second amendment (using 443 gallons of sodium lactate) was conducted. 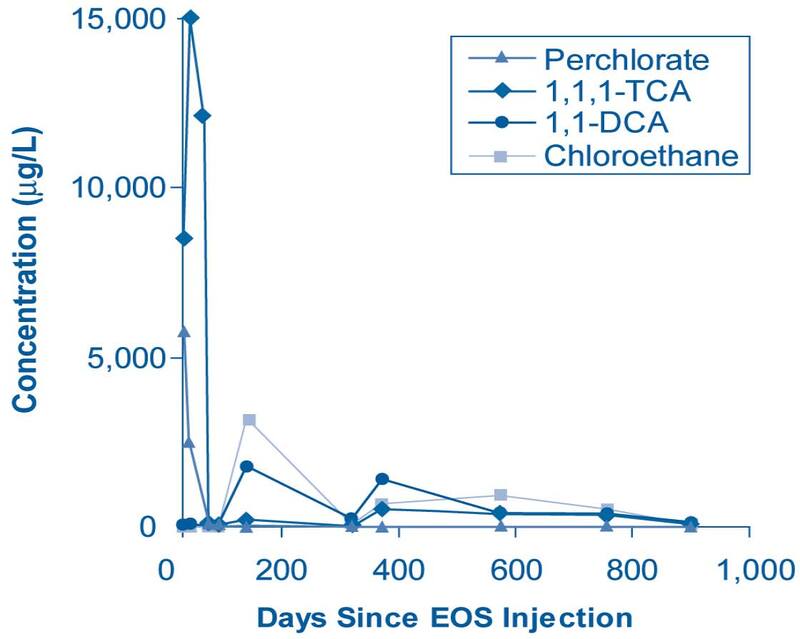 Ground-water sampling indicated perchlorate concentrations within the biobarrier had decreased from an average of 450 µg/L to approximately 13 µg/L within approximately three months after the second injection cycle. Only minimal impacts on secondary water-quality characteristics such as increased sulfide or manganese concentrations were noted. Ground-water sampling after the second amendment also indicated variability in contaminant reductions within different areas of the biobarrier. Subsequent tracer tests suggested that one portion of the barrier received less electron donor than the remainder. A third injection cycle was conducted 11 months later, in November 2005, using an alternate ground-water recirculation pattern. This system modification resulted in successful distribution of electron donor across the biobarrier and more consistent reductions in perchlorate concentrations. In contrast, an active rather than semi-passive biobarrier was selected for use at NIROP due to greater concern regarding potential impacts on secondary water-quality characteristics. The active system also was anticipated to more effectively degrade perchlorate existing in a deeper (120 feet bgs) aquifer within sandy lithology. A dual-well extraction system began operating in late 2005, using ethanol as an electron donor delivered into a central injection well. After 2-3 months of operation, initial field results suggested that the use of ethanol may accelerate fouling of the injection well due to site-specific geochemical conditions. System operation was temporarily suspended in order to complete modifications that would allow use of citric acid as an electron donor, and operations resumed last summer. Ground water currently is extracted from the two extraction wells at rates of 10 and 50 gpm, amended with citric acid, and re-injected into the central injection well on a continuous basis. Concentrations of citric acid are controlled closely, with only small increases being made to approach but not exceed the stoichiometric demand of 7.3 mg/L. Previous applications of active and semi-passive approaches for electron delivery suggest that the active approach more effectively distributes and controls ground-water amendments and is less likely to impact ground water. Implementation of an active system involves higher costs, however, due to increased infrastructure and field operations. Although an active system may require fewer wells, continuous operation of the wells and associated fouling-prevention measures additionally increase costs for operations and maintenance (O&M). A final cost and performance report on the two demonstrations will be available in early 2007 on DOD's ESTCP web site (http://www.estcp.org). DOD anticipates publication and ESTCP posting of the guidance manual, including field and laboratory protocols, later next year. The U.S. Navy and U.S. Air Force are testing various approaches to the design, construction, and operation of biobarriers for enhancing anaerobic bioremediation of chlorinated volatile organic compounds (CVOCs) and perchlorate found at many military facilities. Comparison of systems at the Naval Weapons Industrial Reserve Plant (NWIRP) in McGregor, TX, and Whiteman Air Force Base (AFB) southeast of Kansas City, MO, indicate that the technology may be implemented for short-term use (as at Whiteman AFB) or long-term use involving engineering elements incorporated during barrier construction to facilitate carbon rejuvenation (NWIRP McGregor). Applications at these facilities and other sites illustrate that factors such as media availability, restoration objectives, and budgetary factors play significant roles in biobarrier design and construction, and confirm earlier findings that the technology is best suited to shallow ground water. Nearly 2.5 miles of a biobarrier were installed in segments within shallow weathered limestone at NWIRP McGregor in 2002 to reduce source-area perchlorate plume mass, remediate contaminated ground water before discharge into surface water, and expedite offsite property cleanup. (For background information, view the February 2004 issue of Technology News and Trends online at http://www.cluin.org). Prior to construction, extensive bench- and pilot-scale studies were conducted to evaluate organic media and potential construction methods. 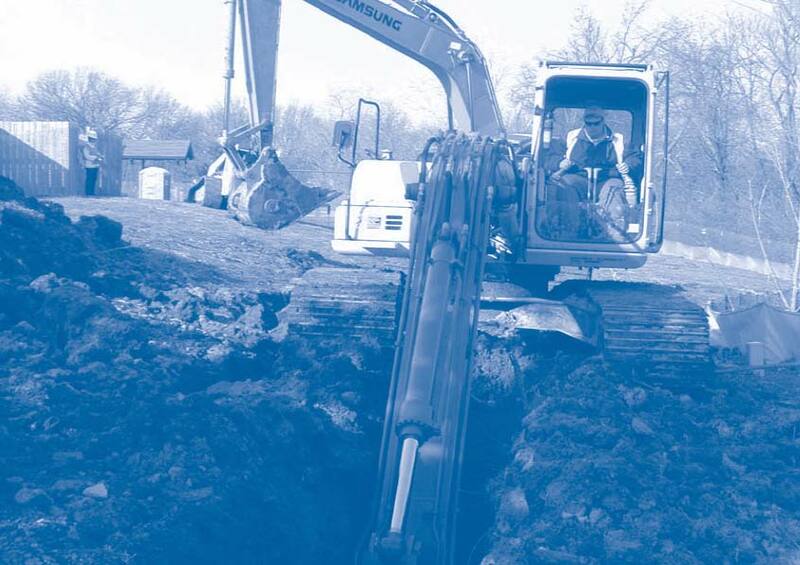 Full-scale construction involved excavation of more than 13,000 linear feet of trenches and backfilling with a mixture of mushroom compost, ¾-inch pine wood chips, soybean oil, and 1-inch crushed limestone. Horizontal sections of perforated polyvinyl chloride piping were installed along the trench bottoms for future biobarrier rejuvenation. Construction costs averaged $200/ft² per linear foot or less than $15 per vertical foot. Periodic monitoring of geochemical indicators such as ORP, total organic content (TOC), and nitrate suggested that carbon rejuvenation eventually would be required to sustain long-term effectiveness of the biobarrier. In August 2006, nearly 22,000 pounds of an emulsified oil substrate (EOS) solution were injected into 15 onsite and offsite biobarrier segments about four years after installation. Follow-on analytical sampling will be conducted this month to assess carbon-substrate injection effectiveness. Sample analysis indicates that the biobarrier continues to effectively treat perchlorate-contaminated ground water, reducing concentrations within the barrier from 1,000 ug/L to below the laboratory detection limit of 2 µg/L. Effective use of the biobarrier and other remedial measures resulted in gaining "operating properly and successfully" approval for the entire remedial system in June 2006. Accomplishing this milestone facilitates upcoming transfer of 3,700 acres of the NWIRP property to the City of McGregor for redevelopment. The alternate biobarrier strategy at Whiteman AFB (in an area known as “Site DP-32”) employed lessons learned at NWIRP McGregor, many of which involved a streamlined design, more conventional construction equipment, and a simpler reactive media mix. The Whiteman AFB biobarrier was installed in the vicinity of a site disposal pit that was part of a former water treatment plant and possibly also used as a hospital burn pit. After the treatment plant was relocated to the west side of the base in the 1960s, military family housing (including a playground) was placed in the area. The housing units and playground were demolished in 2005, and the area is expected to be used for future training activities. Limitations posed by minimal hydrogeologic data (particularly related to ground-water residence time) that would not impact biobarrier design and implementation. A full-scale 270-foot-long, 10- to 20-foot-deep biobarrier was constructed at Whiteman AFB in March 2004 as part of a treatability study. The system was installed in a 5- to 10-foot-thick clayey gravel (weathered bedrock) layer using conventional excavators (Figure 3). Keying into an underlying and competent shale layer, the barrier trenches were constructed in approximate 40-foot sections to minimize side-wall sloughing and facilitate ground-water management during field activities. Trenches were backfilled with a 1:1 mixture of organic mulch and clean sand. To minimize material and transportation costs, recycled vegetation from the facility was selected as the organic mulch instead of ground corn (despite slightly higher organic carbon and nutrient concentrations) from a local grain elevator. Due to the short-term use anticipated for this system, no injection piping was installed during construction to facilitate organic-substrate replenishment. Figure 3. Trench depths for the Whiteman AFB biobarrier system varied from 10 to 20 feet, depending on elevation of underlying competent shale bedrock. Costs for installation of the Whiteman AFB biobarrier, which involved minimal collection of new hydrogeologic data and condensed design planning, totaled approximately $74,000 (about $275 per linear foot or less than $20 per vertical foot). Despite these budgetary limitations, nearly two years of monitoring show that significant CVOC degradation is occurring within the biobarrier and CVOC concentrations in downgradient wells are 88% lower than in upgradient wells. Sampling results also show indirect evidence of enhanced reductive dechlorination in ground water passing through the barrier, including increased ferrous iron concentrations and decreased ORP, dissolved oxygen, and nitrate levels. Pre- and post-construction gradient measurements suggest that the biobarrier has not impacted ground-water flow. Based on the results of a revised human-health risk assessment conducted after biobarrier installation, the Air Force and Missouri Department of Natural Resources determined that potential site risks were within acceptable risk thresholds. As a result, additional biobarrier monitoring to determine its longer-term effectiveness is not anticipated. EPA is publishing this newsletter as a means of disseminating useful information regarding innovative and alternative treatment techniques and technologies. The agency does not endorse specific technology vendors.